"Over half a million viewers from around the world tuned into the Overwatch League inaugural season Grand Final, which was broadcast both online through Amazon-owned online streaming service Twitch, and through traditional broadcasters ESPN and DisneyXD. Harrison says with free to air television broadcasting facing challenges and having an expected annualised decline of 2.9% over five years, e-sports may be the new look Australian broadcasting needs to refresh the industry however not everyone thinks there is room for the new industry. Reported earlier in the year Southern Cross Austereo (SCA) CEO Grant Blackley labelled the e-sports industry in Australia 'the wild west' in terms of securing rights and profitable deals. "We remain open to entry into the sector but I think it is fair to say that e-sports for Australian rights is a bit of the wild west and most parties are not making any money." Said Blackley. This has not stopped Gfinity eSports Australia from entering broadcast deals with Amazon-owned social video streaming service Twitch and Ten's multichannel, One. E-sports will continue to grow as a global market and Australian broadcasters have the chance to take a risk that can either fall short or turn into a lucrative deal. According to IBISWorld, which explores the rise of competitive gaming in Australia and its impact on broadcasters in a new report, it anticipates that purchasing the rights to broadcast e-sports could become the next source of revenue for traditional television in Australia. It says with competitive online gaming has gained popularity since the late 2000s and has continued to bring in a large global audience with more than 143 million people following the sport in 2017. The sums of prize money that can be won at tournaments have not gone unnoticed and it has led to lucrative deals that have sponsors such as Mountain Dew, Red Bull and Coca-Cola supporting teams and tournaments. If large brands like this are getting involved it is proof that e-sports is doing something right and that Australia needs to get involved. 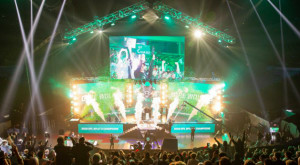 Melbourne has caught onto the rise of the industry as it held the inaugural Melbourne e-sports open which brought in more than 12,000 fans to the event and 12 million content views online, showing the potential for Australian broadcasting to find a new revenue stream. American based sports network ESPN signed a deal with Activision for TV rights to the Overwatch League and broadcasters in Australia should look at similar deals to reinvigorate the industry. “While most e-sports are livestreamed through internet services, traditional broadcasting may still have its place," IBISWorld senior industry analyst, Liam Harrison says.